Tania Michele: Orlando Holiday Diary: Days 7 & 8 - My 25th Birthday & Hurricane Irma! 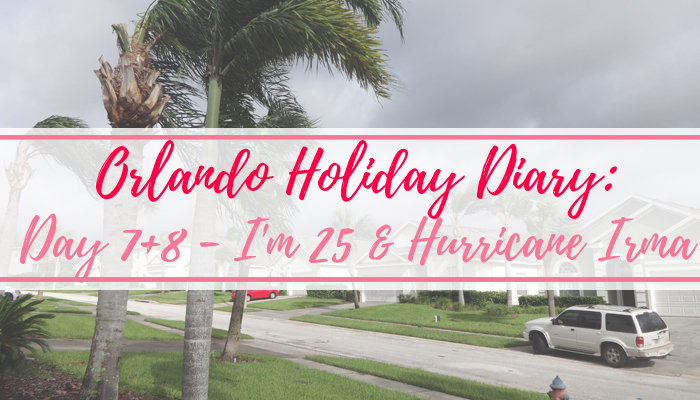 Orlando Holiday Diary: Days 7 & 8 - My 25th Birthday & Hurricane Irma! I can safely say, I will never forget my 25th birthday for as long as I live. I spent the morning opening cards from my friends and family, which we then put up in front of the TV. They lasted less that an hour there, before we opened the back doors and Irma's winds blew them all across the floor. In a slight huff, I threw them into my suitcase and didn't look back at them all week. We had spent most of the first week of our holiday knowing Irma was coming our general direction, but Saturday afternoon they knew it was definitely going to hit the coast of Florida. The hopes at this point were that all the weather and news channels were predicting it was going to hit Miami/Key West, and then Irma would head away from central, and go out into the sea. Well that didn't happen! Instead, early Sunday 10th September - aka my 25th birthday, they realised it was going to pretty much be heading up towards central Florida and Orlando. 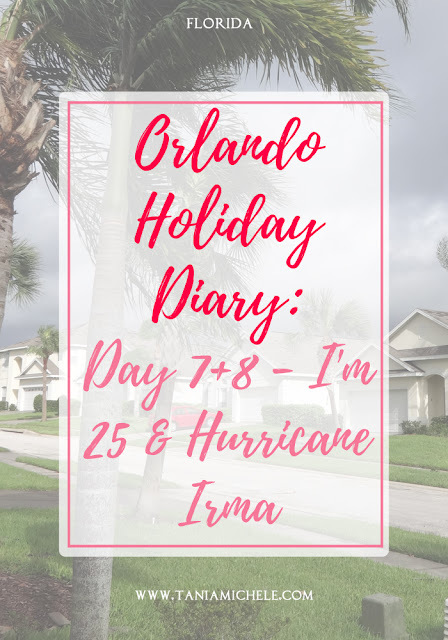 We were in Clermont in Lake County, literally a 10 minutes drive to Orlando, so we knew it was going to hit us directly. The news all day said the eye was going to be going over the East side of Orlando, but around 9:50pm, they said it was more West, so the eye would be right over us. Me and my sister ended up sleeping in my closet, as the News 9 reporters has suggested this, just in case any window were to be blown out in the wind. 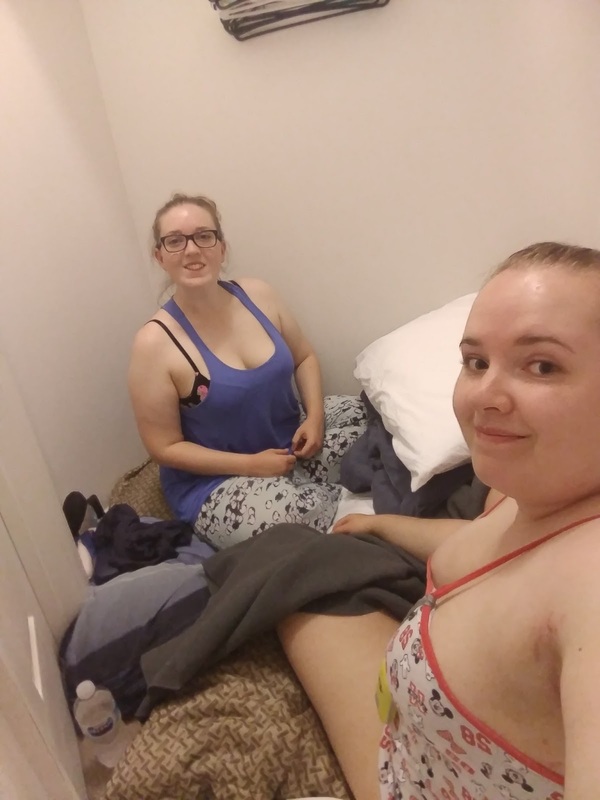 It was very cramped and hot in there, but we fell asleep about 2am, which was about 20 minutes before the eye of Irma went over us. The sounds of the wind and rain was honestly, the scariest sounding situation I've been in before. I won't lie, I was terrified. The next morning, September 11th, we woke up at about 5am, and had a quick look around the villa. There wasn't anything wrong that we could see in the pitch black, so we climbed into my bed and went back to bed. Irma had knocked out our AC and all power, so we spent the next 2.5 days without any power, light or AC! The storm was at 185mph when in the islands, and was just under 80mph by the time it went over us. We were actually really lucky that we only got the ending of the storm, as the damage on the islands was soul crushing. Even now, some of the islands and Key West, are still destroyed and being repaired. I was scared enough with 80mph, and I cannot even imagine the 185 those people had to endure. When day broke, the pair of us and Dad went outside to check out the destruction. The wind was at a strong 50mph now, so we were under strict curfew for the day, so we only got as far as the end of the driveway. Thankfully the only damages we had were a load of roof tiles come off, some netting around the pool ripped off, and the pool cover had been blown into the pool and had some tears in it. Overall, we were extremely lucky to have as 'calm' winds as we did compared to the Virgin Islands, and the surrounding islands. By the end of Monday 11th, we had been in the pool and played every single game in the villa. We ended up in bed at 8pm as it was so dark and we couldn't do much! Thankfully, the curfew was lifted at 6pm, meaning we would be allowed out of the villa on the Wednesday - yay!